Over/Under: Over 151.5 at 1.90 Bet Now! 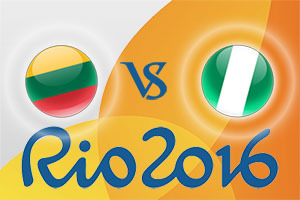 Lithuania got off to an ideal start in Rio by defeating the host nation in their opening game of the 2016 Olympic Games. This isn’t the sort of result that would leave the home crowd smiling and happy but that won’t have bothered the Lithuanian players and fans too much. Mantas Kalnietis from EA7 Emporio Armani Milan grabbed 21 points in the win but it was a strange game. Lithuania had a strong first half with a stunning second quarter but in the second half of the game, the hosts roared back while the Lithuanians coasted to the end. There was enough about them to see out the game in decent style without too many worries but there will be some concerns about the way that Lithuania tailed off in the second half of the match. Nigeria were comprehensively outgunned by Argentina in their opening game of the 2016 Olympic Games, and they will be desperate to get a result in this game. It will be a very difficult challenge but if Ike Diogu can have another strong performance, they may have a chance. Diogu provided 15 points and 13 rebounds in the loss but that was a solid return from a player who is likely to carry his nation’s hopes on his shoulders. It will come as no surprise to see the bookmakers backing Lithuania to win by a large margin and you should look to take Lithuania at -18.5, which you can find at odds of 1.90. When it comes to the Over/Under market, you should be looking to go OVER 151.5 which is on offer at odds of 1.90. Bet Now! There aren’t too many Prop bets on offer for this game, which isn’t a surprise, but if you expect Lithuania to take control from early on, taking them at half-time and full time could provide you with a return for not much of a risk. The odds for Lithuania to lead at half-time and full time are 1.16. The game starts at 2300 BST on Tuesday 9th of August.